Change/Select the Target Location of a Link in a Form. 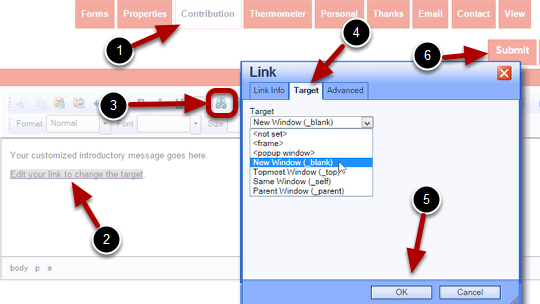 In this lesson I'll show you how to make a link in your form open a new tab. 1. 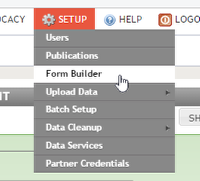 Start by going to Form Builder. Click the 'Edit' icon next to the form you want to change. (1) Select the tab where you have/want the link. (2) Highlight the text you want linked. (3) Click the 'Link' icon (a globe with a chain). (4) Select the 'Target' tab for the link. 'New Window' will open a new tab, 'Same Window' will redirect the tab you are on currently, 'popup window' will create a popup window. The other options are dependent on how the page is hosted. (5) Click the 'OK' button. (6) Click the 'Submit' button and the target window for your link will be changed!